Scientists at the WSU Cook Farm have a 30-plus-year plan to understand long-term impact and changes in agriculture. Along with colleagues around the country, they’ll help farmers and others better understand and cope with drought or other environmental changes. The USDA selected the farm as a Long Term Agroecological Research (LTAR) site in 2011, one of eighteen locations around the country looking at how different farming systems might respond to weather stresses, natural disasters, or market changes. At the Cook Farm LTAR site, Dave Huggins and other scientists investigate agroecological processes at scales that range from the molecular and microbial to the field, landscape, and atmosphere. For example, at 369 georeferenced points on one 92-acre section, field sampling and instruments collect data on crop productivity, soil organic matter, soil-borne diseases, the weed seed bank, water quality and dynamics, carbon sequestration, and more for analysis. WSU soil microbiologist and ecologist Tarah Sullivan says, “Microorganisms connect everything everyday in every way,” and that understanding those connections is key to a healthy future. Sullivan’s work focuses on how microbial communities in soil impact heavy metal biogeochemistry. Many metals are important micronutrients for both plants and animals—but too much of a good thing can make plants sick. And some metals are toxic and need to be removed or sequestered so they don’t enter the food chain. Lynne Carpenter-Boggs in the ancient, acidic, and nutritionally depleted soils of land-locked African country Malawi. Many soils in Malawi are clays that love to bind up phosphorus in ways that make it unavailable to a plant. Different as they seem, the soils of Eastern and Western Washington have one thing in common. They come—either by water, wind, or ice—generally from elsewhere. And what takes eons to form can be covered over or erode away in a geologic heartbeat. Soil scientists and other researchers at WSU–such as Bruce Frazier, Craig Cogger, John Reganold, Alan Busacca, Ann Kennedy, and Doug Collins–have mapped and explored Washington state’s soils and soil microbiomes for years, to inform appropriate agricultural research and innovative agricultural practices. Ammonia based fertilizer, which provides nitrogen, can offer a great boost to even an otherwise not so healthy soil. But ammonia fertilizer, which depends on petroleum for its manufacture, is becoming very expensive. The consistent high yields of wheat on the Palouse depend on applying about 100 pounds of fertilizer per acre, with that fertilizer currently costing $50-80/ton. More significant, however, is not the cost, but the long-term effect of applying so much fertilizer. Soils on the Palouse before farming were generally neutral, with a pH of 7, says Rich Koenig. Since then, the pH of the soil has dropped in some cases as much as two full pH units because of ammonia-based fertilizer use. Two pH units represent a 100-fold change, so those soils are 100-fold more acidic than they were 30 years ago. The traditional remediation for low soil pH is to add lime. Unfortunately, lime in the Pacific Northwest is not readily available. Shipping in sufficient lime to treat the fields would be astronomically expensive. Koenig’s research group is exploring some of what he considers short-term solutions. John Reganold obviously did not discover organics. But he was one of the first academic scientists to understand and explore its benefits. His earliest research showed the organic agriculture benefits of improving soil quality and decreasing soil erosion. Later, he showed the benefits of organic farming to crop quality, nutritional quality, energy efficiency, profitability, and pesticide impact on the environment. These results were published in Nature, Science, Proceedings of the National Academy of Sciences, and Scientific American. Reganold’s work has led to at Organic Agriculture Systems major at WSU, the first such major in the United States. The beneficial relationship of plants with bacteria called rhizobia was the research focus in the laboratory of Michael Kahn, a professor in Washington State University’s School of Molecular Biosciences, Center for Integrated Biotechnology, and Institute of Biological Chemistry. Building soil health is becoming increasingly important worldwide. Soil imbalances in essential crop nutrients can be addressed by applying fertilizer and organic amendments. And soil chemical, physical, and biological properties can be significantly improved by adopting management practices such as no-tillage or reduced tillage. 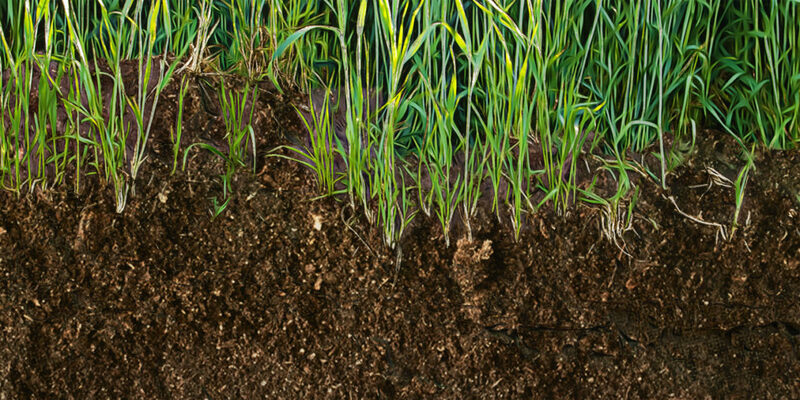 Researchers are finding, in the US and in many other countries, that concentrating soil organic matter in the top 2″ promotes several aspects of soil health including nutrient cycling, resistance to erosion, and water infiltration and storage. They find that maintaining a high proportion of organic matter at the soil surface, relative to deeper layers, is more important than the total level of organic matter in a soil.